I was brought up believing that Lou Wong and Onn Kee serve the best Bean Sprouts Chicken aka Tauge Ayam aka Nga Choy Kai in Ipoh. If you have doubts, just hop over to Jalan Yau Tet Shin area (they’re situated opposite of each other, somewhat at each other’s neck, if you will) come dinner-supper hours on weekends or public holidays, and I’m sure you’ll be eating your words faster than politicians making empty promises. Don’t doubt the number of chickens hanging in front of the stall, in all their glistening glories. They poach the chickens on-the-spot once the chickens hanging on the hooks are sold off. 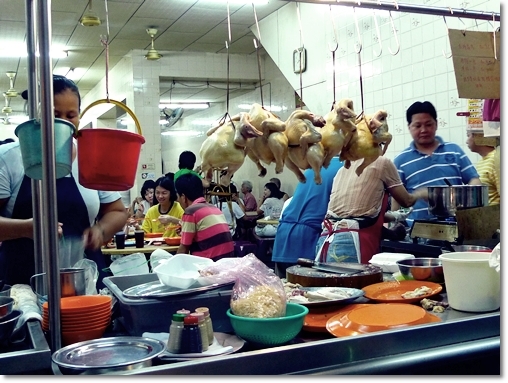 Then people started to argue and fought over the BEST Tauge Ayam (or Ayam Tauge, whichever suits your fancy) in Ipoh. For one knows that holding the crown means a lot, as this is unofficially Ipoh’s most famous food, bar none. So where does Cowan Street Ayam Tauge & Koitiau come into the picture? The boss, Ah Meng in his element. The compulsory accompaniment of chopped ‘cili padi’ in soy sauce, and the metal pot of delicious braised chicken feet. 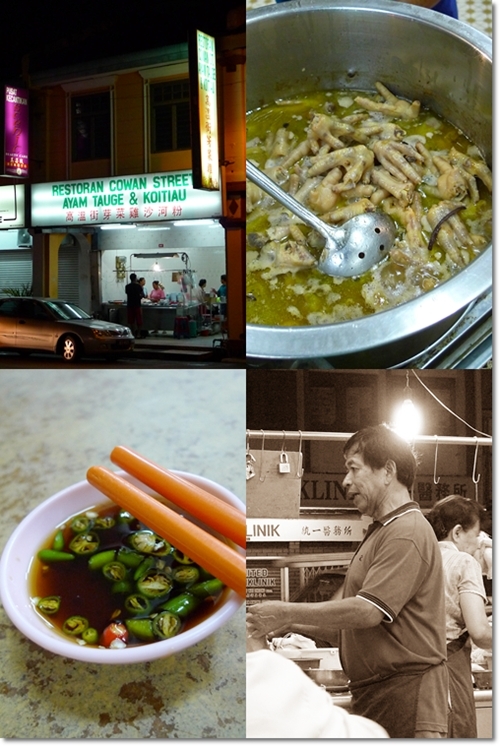 Many locals swear by Cowan Street’s version of the signature Ipoh fare. Even trumping the BIG TWO mentioned earlier in the post. Of course, there are detractors as well, some swearing allegiance to Fifteen Tower’s version (which coincidentally, is the brother of Cowan Street’s), some patronize the Buntong Ayam Tauke instead, while I personally kind of like Kam Hor‘s smooth Sar Hor Fun (Ipoh’s famous kuey teow/flat rice noodles). 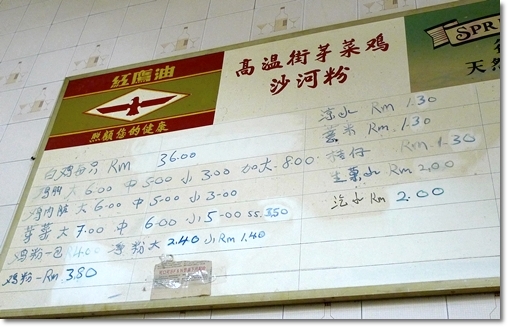 The Price List on the wall, so you know you won’t get ‘chopped’, no matter which state or country you’re from. But Cowan Street Ayam Tauge is notorious for their random business hours. Yes, so random that you have to literally push your luck, and keeping your fingers crossed for the restaurant to be opened on the day you crave for Bean Sprouts Chicken the most. Which kind of explained why I have yet to blog about this place after 2 years of blogging. But this time I was adamant. I put my heart into it, and paid them a visit on a Sunday evening. Firm, smooth and tender chicken poached to perfection, then served with soy sauce, shallot oil, a dash of sesame oil, and garnished with the usual scallions and coriander. Thankfully, the trip was worth it. For a variety of reasons. The shop was opened and business was booming (we had to wait a good 5-10 minutes for a seat), yet the proprietors were friendly, and not as grumpy as I had pessimistically expected. The ordering is simple. Just mention the number of portions, and you’ll be served with the uniformed dishes of poached chicken, blanched bean sprouts, and a bowl of Sar Hor Fun in soup. Of course, if you’re seeking for something more, go for the extra dishes; Braised Chicken Feet and/or Mixed Gizzards. 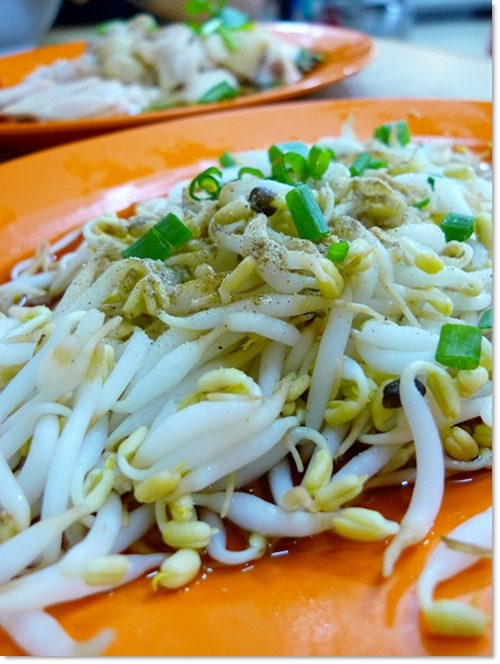 Plump and juicy, I can’t find any fault with Ipoh’s bean sprouts. Nor any worthy contender elsewhere! The Braised Chicken Feet may look unpalatable, with a thick layer of oil on the surface of the pot, and some chicken feet even came ‘unpolished‘ (nails/claw intact! ), but the gravy was absolutely lovely. Redolent with spices, most notably star anise and five-spice powder, I can imagine having a plate of rice with these gelatinous limbs of the chicken!! The Poached Chicken and Blanched Bean Sprouts at Cowan Street’s tasted fabulous, almost to the point of no laments. Seriously. 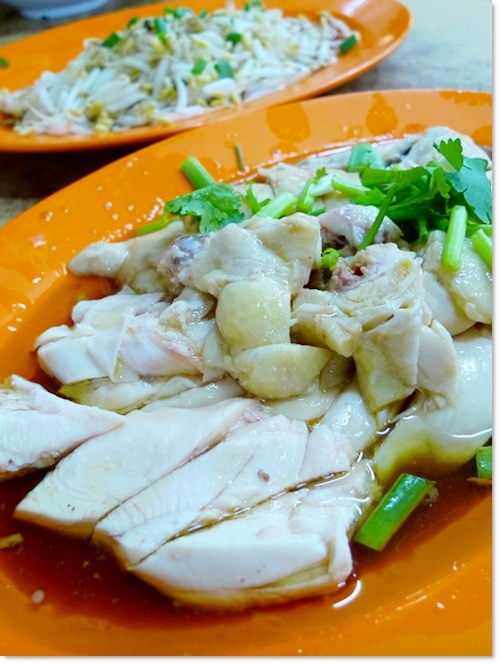 Whereas there were times when Lou Wong under-cooked their chickens, resulting in a bloody serving, and many others tend to over-cook theirs, Cowan Street Ayam Tauge poached their chickens almost perfectly. Smooth, firm and tender, yet every single part was cooked. And the sauce complemented the chicken very well, being neither too oily, nor salty. 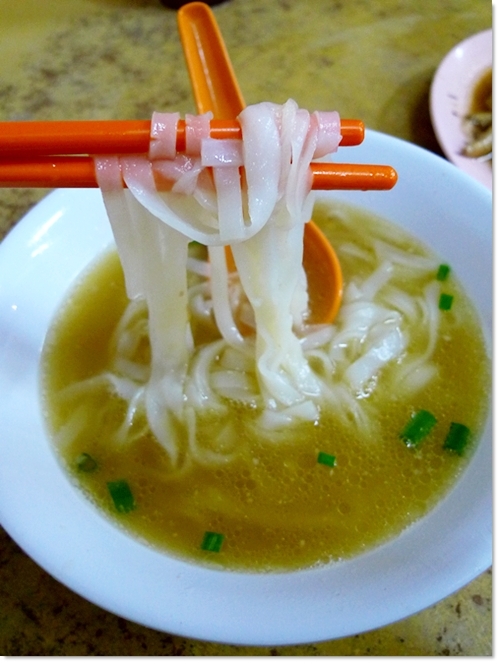 More impressively, the bowl of Sar Hor Fun (Kuey Teow Soup) was unlike the generic version. At Cowan Street’s, the soup resembled Thean Chun’s “Kai See Hor Fun” more, with a sweet-ish, aromatic hint of prawn (heads, shells and all) in the stock. That killer ingredient was what made me going over and over again to Thean Chun in Old Town for my fix of Kai See Hor Fun. No other place comes close, really. Just like how we go Melaka and eat their chicken rice balls, durian cendol and nyonya food in restaurants. Then the locals would say; Aiya, those are not the best, and what’s so special about chicken rice balls anyway?! Cowan’s Street’s portion is slightly more than Fifteen Tower’s in my opinion, while Lou Wong’s hor fun can be good on some occasions, while not so good on the others. Onn Kee is somewhere in between, though I like Lou Wong’s bean sprouts more than the others. Maybe I went on the right day? Oily? Yes. Cannot deny that, since the sauce (a concoction of very different flavours compared to the other ones) and the broth for the noodles make Cowan’s version special. Another thing that comes to mind naturally is their extremely unpredictable business hours. Thanks Vincent for sharing your experience. Hi, do you know what time they close then? Not sure, Eve. But usually would be rather late …. I am really glad to read this blog posts which carries lots of valuable facts, thanks for providing suchh information.